HUGE THANK YOU TO ALL WHO ATTENDED THE BOARD OF SUPERVISORS HEARING ON MARCH 12. YOUR OUTSTANDING EFFORT ADDED CRITICALLY IMPORTANT TESTIMONY AND COMMENTS TO THE RECORD, SETTING THE STAGE FOR A COMPREHENSIVE LAWSUIT AGAINST THE COUNTY TO BE FILED BY APRIL 26, 2019. VC COLAB IS SOLICITING FOR AN INITIAL $75,000 IN DONATIONS TO THE LEGAL FUND TO FILE THE COMPLAINT INITIATING THE LAWSUIT AND… WE ARE IN IT TO WIN IT!!! Click Here to Donate to the Wildlife Corridor Legal Fund! 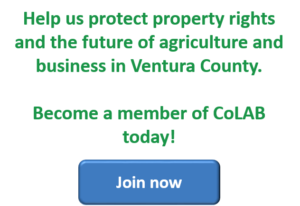 The Ventura County Board of Supervisors passed this complicated ordinance on 3-12-19, rezoning over 160,000 acres of land, severely limiting the security, usage, fire protection and value of private properties. On Thursday, February 28th, CoLAB’s legal team at Jeffer Mangels Butler Mitchel submitted a letter to the County showing the many defects in the proposed Wildlife Corridor Ordinance including mapping errors, security concerns, fire hazards, and lack of scientific evidence for the “Critical Wildlife Passage Areas”. The JMBM letter supported the adoption of the Planning Commission’s recommendations to re-evaluate the restrictive regulations that address some of the flaws in the ordinance. The letter also revealed a discovery email from our Public Records Act from a County biological consultant on page 8 that is quite revealing. On Tuesday, March 12, the wildlife corridor ordinance was passed in a 3-2 vote by the Board of Supervisors with Supervisors’ Long and Huber dissenting. 4) Our huge presence at both the Planning Commission and Board of Supervisors hearings. However, through overwhelming feedback from our board of directors and membership, the final ordinance is unacceptable. The adopted ordinance places unreasonable restrictions on fencing, walls, lighting, and structures that will compromise the security of families and prevent property owners from reasonable use of their land. The ordinance is more akin to a “conservation easement” than to an overlay zone. The forced conservation easement provides no compensation, has no negotiated conditions and does not provide any allowances for the individual needs of families who own and pay taxes on the properties. Because the Ordinance was based on studies and models that were done over 13 years ago, they are no longer accurate, and no longer reflect what is needed to create and protect valid wildlife corridors. The corridor pathway through the fully developed Bell Canyon subdivision is evidence of the model’s outdated and faulty assumptions. The ordinance imposes an arbitrary 200′ buffer to “surface water features” shown on a flawed and outdated U.S. Fish and Wildlife map. Brush clearance, structures, fencing and many uses are restricted within the buffer. There are no biological studies cited with stream modeling to justify the need for such wide passageways through private lands. Against the County Planning Commission, Planning Director and Planning staff recommendations, Supervisors Bennett, Parks and Zaragoza voted to increase the stream buffers from 100′ to 200′, doubling the area in the county that will be restricted from brush clearance. Over 147,000 acres within the wildlife corridors are in State Fire Hazard Zones and the vote to restrict brush clearance efforts in these areas is irresponsible as it increases the risk to people, habitat and structures from the devastation of wildland fires. Over 115,000 acres of this proposed corridor burned in the Thomas, Hill and Woolsey fires. All three of the tragic recent fires started in or directly adjacent to the proposed corridors. These fires scorched over 383,000 acres and burned 3180 structures in three Counties. The recent fires devastated wildlife populations and their habitat. Mountain lions and bobcats were lost in the Woolsey Fire. The National Park Service estimates that the Santa Monica Mountains lost half of its habitat in the fire, burning 100,000 acres or 88 percent of the area’s federal parkland (cnn.com 12-7-2018). Within the corridors, the County arbitrarily designated 9,311 acres in three “Critical Wildlife Passage Areas”. Instead of honoring their original intent presented to stakeholders to identify narrow critical connections, the County crafted a broad criteria that allowed selection of private properties they long desired to restrict. Without the burden of biological modeling or analysis, the County grabbed a ridge next to Lake Casitas that they previously targeted for a Scenic Resource Protection Overlay Zone in 2007. The Oakview “Critical Wildlife Passage Area” is 1,138 acres of mainly agricultural zoning, with a premier winery that will face an uncertain future if this ordinance passes. CoLAB is recommending that the Oak View area be removed from the CWPA. In a second move against the recommendations of the County Planning Commission, Planning Director and Planning staff, Supervisors’ Bennett, Parks and Zaragoza voted against removing the Tierra Rejada Valley from the “Critical” Passage Area designation. This rural agricultural valley ranges from 1 to 2.5 miles wide, hardly a restriction for wildlife passage. The most absurd of the selections is the Simi Hills CWPA consisting of 5,027 acres including the largely developed Bell Canyon Community. Even though there are ample conservation lands west of Bell Canyon that could easily have accommodated wildlife movement, this neighborhood that was ravaged in the Woolsey fire was selected to be zoned for critical wildlife passage. All parcels in the CWPAs are subject to lighting, fencing, stream buffers and vegetation management restrictions as in the rest of the corridors. They are also subject to SOAR. Regulations in these designated critical areas are unwarranted and must be challenged in court. Our legal counsel is preparing a comprehensive legal challenge including a challenge to the County’s legally deficient determination that the Ordinance is exempt from CEQA. Without a full CEQA analysis, the proposal is rife with potentially significant environmental impacts, unintended consequences, and negative effects to property owners. CoLAB supports reasonable efforts to minimize impacts to wildlife movement within the County. However, many of the regulations in the proposed ordinance are legally flawed and scientifically unsupported, unwarranted, and unnecessary. 1) Go to the County Online Mapper, find your parcel, click on the layers in the upper right hand corner of the screen and turn on the stream buffers. You may be surprised at the amount of your land that will be restricted from lighting, fencing, brush clearing/thinning and structures. 2) Help CoLAB fight this regulatory overreach by contributing to the VC CoLAB Wildlife Corridor Legal Fund (CLICK HERE) or send a check to VC CoLAB with Wildlife Corridor Legal Fund in the memo section and mail it to 1672 Donlon St., Ventura, CA 93003. VC CoLAB is under contract with Jeffer Mangels Butler and Mitchell LLC to represent our members in this regulatory overreach. (JMBM’s Land Use & Zoning Practice is Ranked as Los Angeles Metropolitan Tier 1 “Best Law Firm” for 2019 by U.S. News & World Report.) We are working with Ben Reznik, Chair of JMBM’s Government, Land Use, Environmental & Energy Group in Los Angeles. JMBM was successful in a recent land use lawsuit against the County of Ventura in February of 2018. The attorneys are preparing letters to the Board of Supervisors expressing a multitude of legal issues with the ordinance. For information and updates on the Wildlife Corridor Ordinance please continue to check this website page. Also, feel free to contact Lynn Jensen execdirector@colabvc.org or (805) 633-2291 for more technical information.